Water gushing in streams and torrents, down cliffs as veils, tumbling over boulders and passing gently over pebbles. 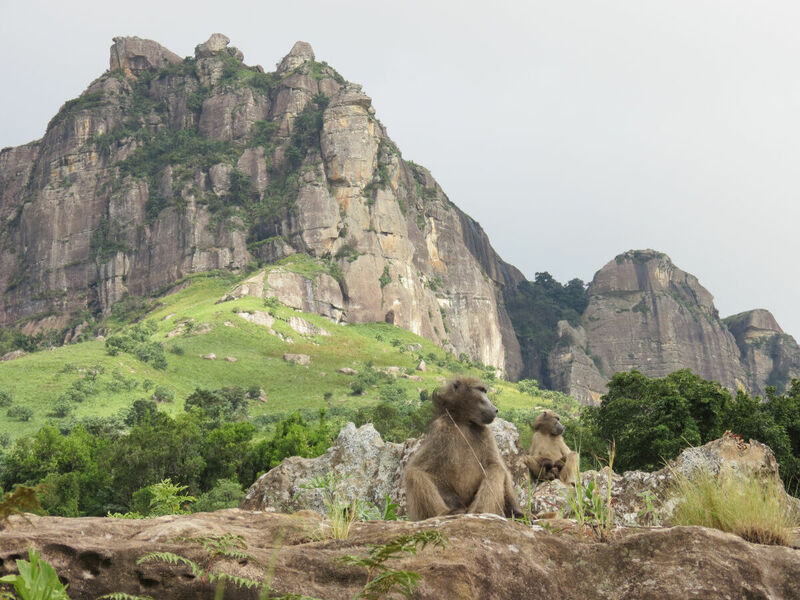 On a gentle hike from Tendele in the Royal Natal National Park, these are just some of the encounters with this magnificent element of nature. 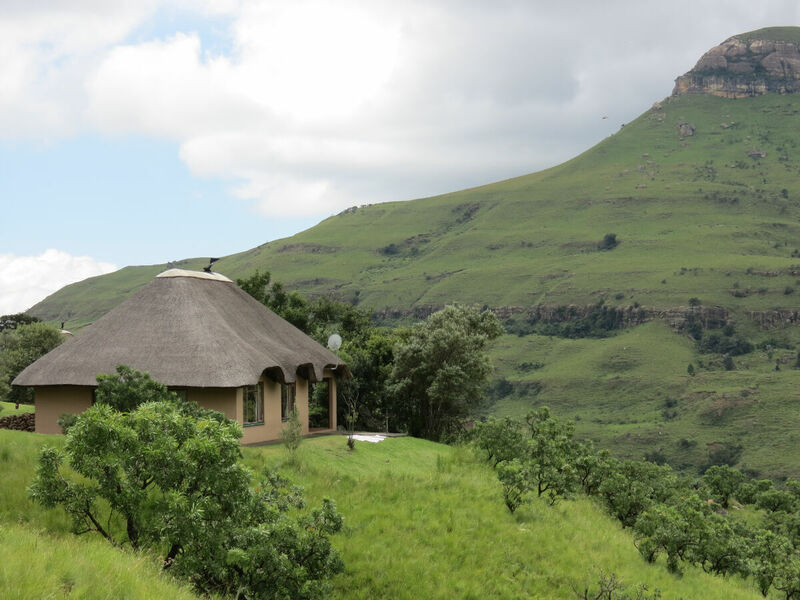 Tendele commands a grand view of the Amphitheatre, a prominent wall in the Barrier of Spears – the Ukhahlamba or the Drakensberg mountain range. 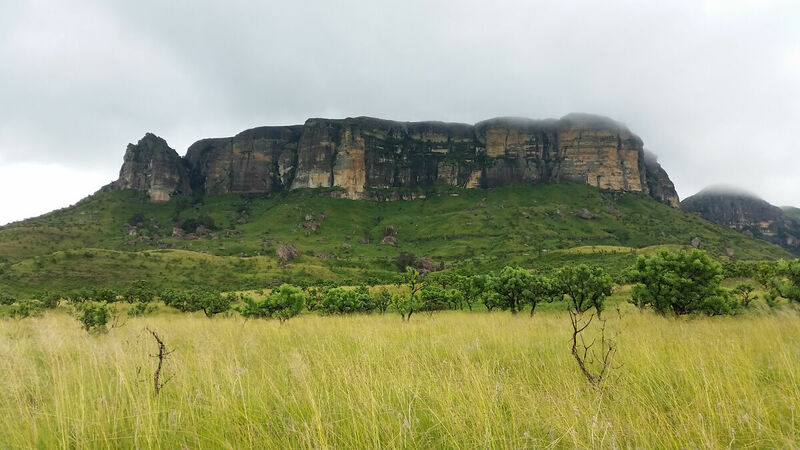 Beyond this great wall lies the peak of Mont Aux Sources, the lifeblood of South Africa’s water supply. It is from here that the Vaal and Orange rivers start their course to the Atlantic. 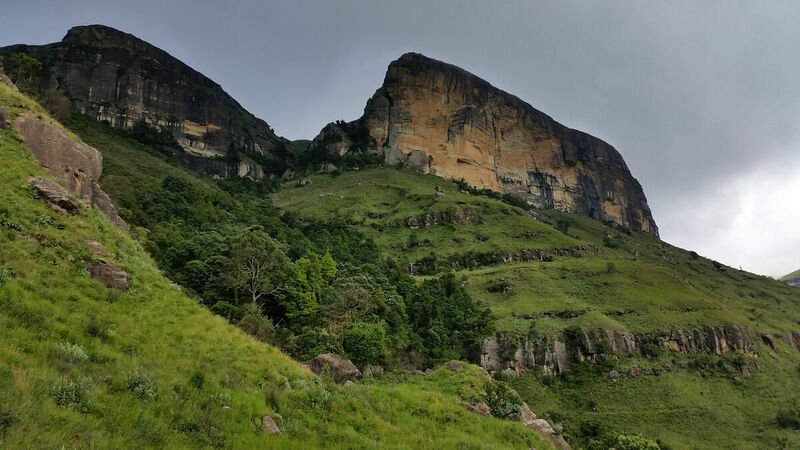 And the dramatic Tugela falls down the Amphitheatre face (the second highest in the world), and snakes its way through verdant valleys to the Indian Ocean. At the start of the hiking trail, two baboons catch the morning warmth from a boulder, warning the troop ahead of our presence. Leaving half eaten bulbs on the path, they scurry off into the dense bush. 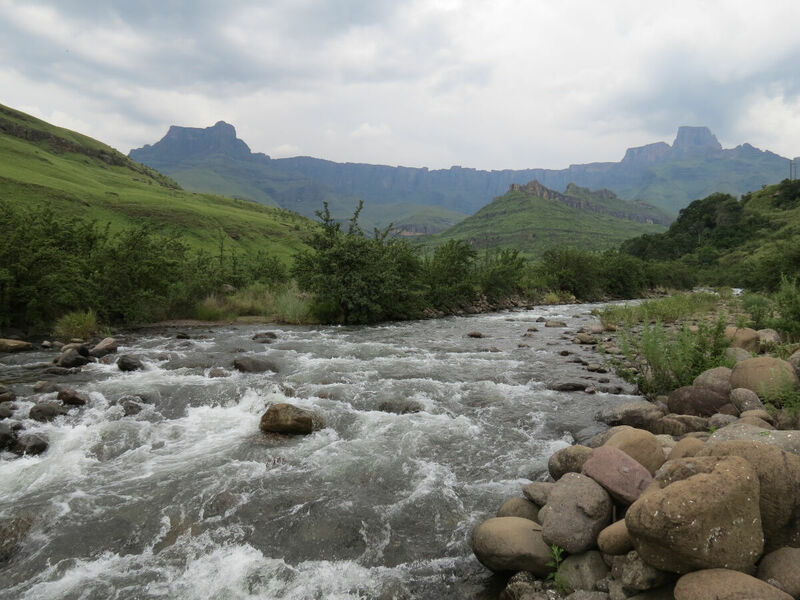 The trail from Tendele to Tiger Falls is a gentle one, but the views are rewarding. The hills are covered in rolling grasslands; a lush green at this time of year. 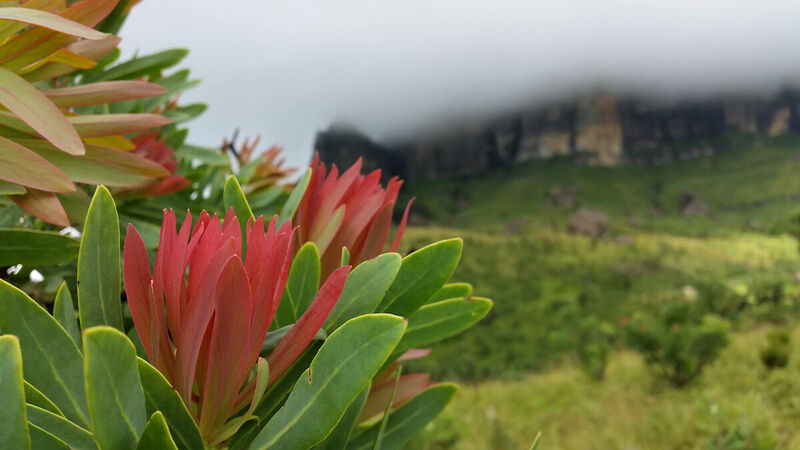 Proteas colour the landscape and attract a host of birdlife. The Amphitheatre hooded by dense clouds is at our rear, and golden sandstone cliffs with pockets of indigenous forest lie ahead. In one such forest, layers of fine spray plummet in a series of veils, and must be perfect on a hot summer’s day. Today however, there is a coolness in the air and a puzzle of clouds threatening rain. 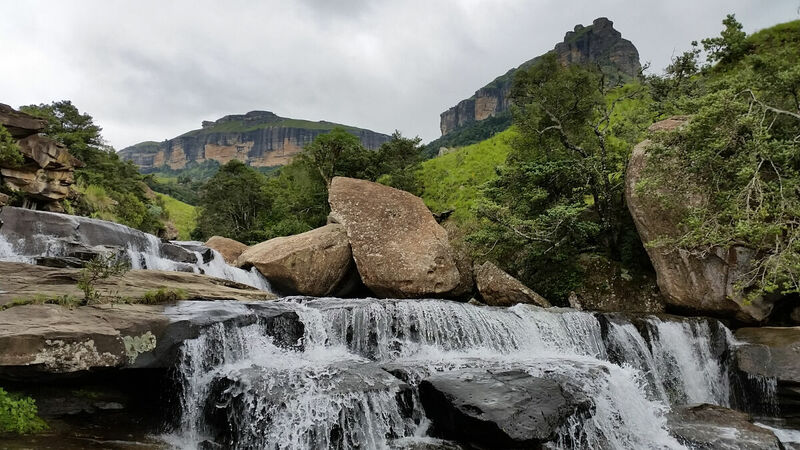 Onward from Tiger Falls, the trail continues over streams, to a view a dramatic Gudu Falls and further to a powerful cascading river, the Mahai. Here, the power of the cascades is both loud and calming. Descending into the valley and following the course of the river, the mind easily comes at peace. The return path zig zags a contour through grasslands, in some places overgrown with the recent wet spell. Horns appear from the cliff edge, and soon a large herd of eland are on the plateau where I am. My presence surprises them and within seconds, and with a thunderous gallop they move to safer pastures further up the mountain. 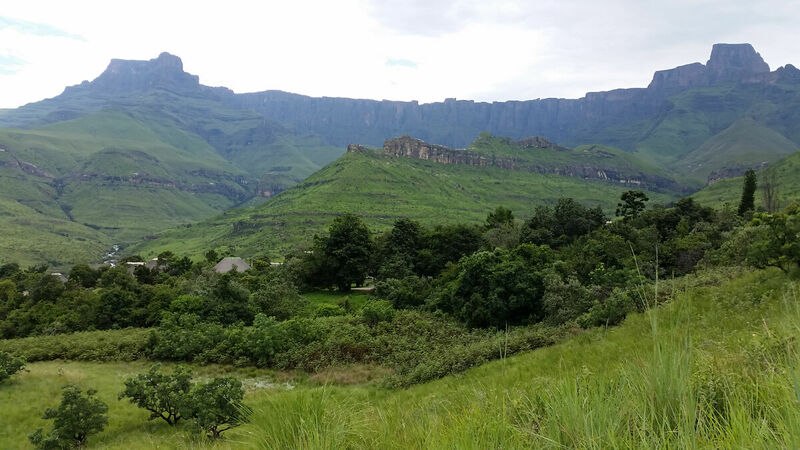 Back at Tendele, the air grew cooler and the patchy clouds interlocked until the Amphitheatre was nowhere to be seen. By nightfall all was drenched; the mountain streams being fed so that the cycle can continue. I never got to see the summit uncloaked again, but was rewarded with an ever-changing panorama.